The timeline for the events leading to the construction of Dodger Stadium and the failed federal public housing project in Los Angeles named “Elysian Park Heights” is often mistakenly represented. The Federal Housing Act of 1949 was created to provide funding to cities for public housing projects. Late in 1949 and the early 1950s, a federal housing project was scheduled to be built in Chavez Ravine, Los Angeles and residents were notified by the Housing Authority of the City of Los Angeles that they would receive three independent fair market appraisals for their properties and subsequently have to move, if they accepted compensation for their land. With the promise that the project was for “families of low income” and they would be the first to return to the new “Elysian Park Heights”, all but a few residents left in 1951-52. Those who stayed did so without paying for services or property taxes for eight years. Renowned architects Richard Neutra and Robert Alexander were hired to design detailed plans for the 3,364-unit housing project, one of 11 throughout Los Angeles at a cost of $110 million. But, a change of political winds, charges of “creeping socialism” and a negative vote of the L.A. citizens doomed the housing project in 1953. The land laid dormant for seven years. Norris Poulson, who ran against public housing in 1953, was elected as the new mayor of Los Angeles. He then made arrangements for the land to be purchased by the city from the Housing Authority. For years, Poulson and the City Council struggled with how to use the largely barren and hilly area. Several ideas were floated, including a zoo, cemetery, man-made lake, state college, expansion of the Police Academy and a city park. If any of the above were to be developed, funds would have to be allocated by a vote of the City Council and, at the time, there was nothing in the budget for any of these projects. For whatever use city officials would decide on, the few holdout residents had to be removed. During this same period, Dodger President Walter O’Malley’s sole focus was seeking a solution to an aging Ebbets Field in Brooklyn. In 1946, O’Malley had started the search for an answer to a new stadium in Brooklyn for the Dodgers. His quest for a new, privately-financed stadium continued for an unprecedented 10 years as discussions with New York officials continued and sites were considered. His preferred location was the intersection of Atlantic and Flatbush Avenues in Brooklyn. It was only after all of O’Malley’s options were exhausted in New York that he considered Los Angeles in earnest in 1957. L.A. officials recognized the opportunity. In August 1957, negotiations with the City of Los Angeles led to a contract which, in part, obligated O’Malley to privately build a 50,000-seat stadium. 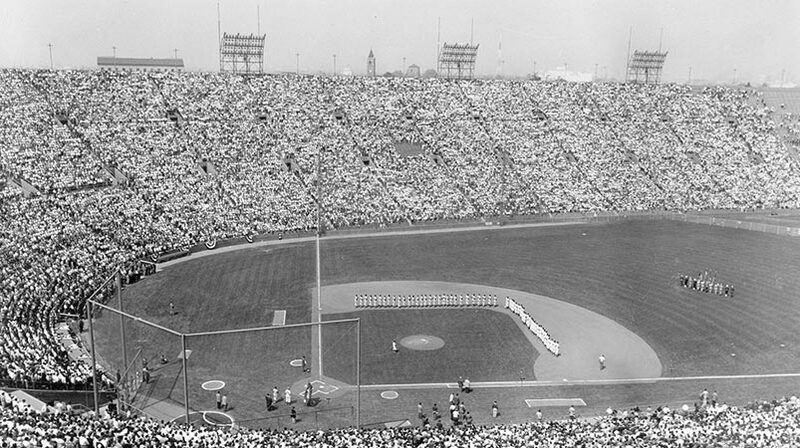 In addition, Wrigley Field in downtown Los Angeles was deeded by the Dodgers to the city of L.A. In the exchange, the Dodgers received acreage with restrictions in Chavez Ravine to build the stadium. By 1959, when construction of the stadium was to start, the city had to evict the last 12 residents, who had ignored repeated eviction notices. In May 1959, the city evicted the final few residents. The public housing project in 1949-50 forced removal of property owners in Chavez Ravine, not the Dodgers.